Over the thirteen years that Krista Tippett has hosted her award-winning and nationally beloved radio program and podcast, first under the title Speaking of Faith and now as On Being, the heart of her work has been to shine a light on the most extraordinary voices on the great questions of meaning for our time, people whose insights kindle in us a sense of wonder and courage. Scientists in a variety of fields; theologians from an array of faiths; poets, activists, and many others have all opened themselves up to Tippett's compassionate but searching conversation. 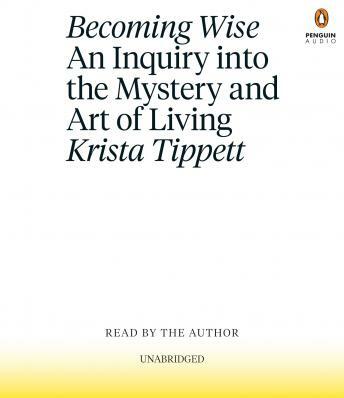 In Becoming Wise, Tippett distills the insights she has gleaned from this luminous conversation in its many dimensions into a coherent narrative journey, over time and from mind to mind, into what it means to be human. The book is a master class in living, individually and collectively, curated by Tippett and accompanied by a delightfully ecumenical dream team of a teaching faculty. Wisdom emerges through the raw materials of the everyday. The open questions and challenges of our time are intimate and civilizational all at once--definitions of when life begins and when death happens, of the meaning of community and family and identity, of our relationships to technology and through technology. The enduring question of what it means to be human has now become inextricable from the question of who we are to each other, Tippett says. And this book is much more than a call to personal growth. It is a grounded and ultimately hopeful vision of human spiritual evolution. It insists on the possibility of a common life for this century marked by resilience and redemption, with beauty as a core moral value and civility and love as muscular practice. Krista Tippett's great gift, in her work and in Becoming Wise, is to avoid reductive simplifications but still find the golden threads that weave people and ideas together into a shimmering braid. One powerful common denominator of the lessons imparted to Tippett is the gift of presence, of the exhilaration of engagement with life for its own sake, not as a means to an end. Called enlightenment, called transcendence, often called nothing because it is beyond language, it is a state whose gifts can be described in many ways--nourishing, edifying, redemptive--as can its celebrants: courageous, tender, adventurous, curious. But presence does not mean passivity or acceptance of the status quo. Indeed Tippett's teachers are people whose work meets, and often drives, some of the most powerful forces of change alive in the world today. In the end, perhaps the greatest blessing conveyed by the lessons of spiritual genius Tippett harvests in Becoming Wise is the strength to meet the world where it really is, and then to make it even better.